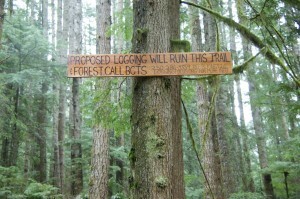 Trail Walks/ Hikes into endangered forest areas are being planned. Please watch for announcements in the local papers and on our Facebook page. Join us this Sunday for a hike into the threatened ‘Clack Creek Gallery Forest’ – a key part of the proposed Mt Elphinstone Park expansion area. 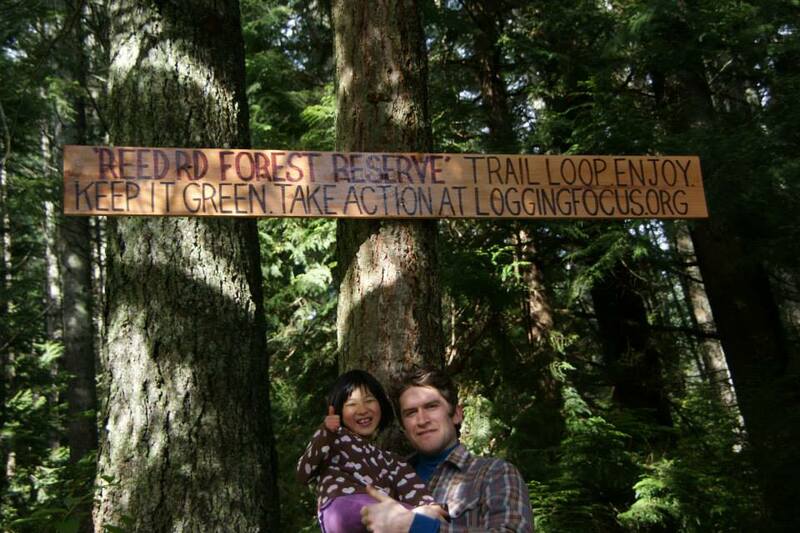 It’s an amazing natural forest directly above the community of Roberts Creek that deserves our immediate attention. This zone contains tall mature trees, the largest patches in the province of the rare snow bramble, a wonderful step-pool stream cascading downslope providing quality amphibian habitat, unique tree formations such as ‘The Tuning Fork Tree’, and a protective space for Roosevelt Elk, black bears, wolves, owls and birds, such as the mouse-like winter wren. But, what does government (through its BC Timber Sales logging agency) want to do with this complex ecosystem? They plan to LOG IT and convert it to yet another tree farm in the coming months unless we say NO. This is your opportunity to visit the Clack Creek Gallery Forest and help us save this magnificent example of natural biodiversity. Mark your calendars for a guided walk that takes us ‘deep into the woods’. Mark your calendars for Tuesday, December 30th at 1PM to join us on a guided walk along the ‘Elphinstone Community Health Trail’. 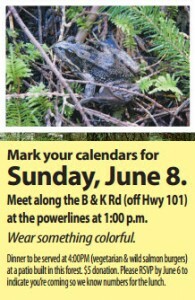 Meet on the B & K Rd (off Hwy 101 in Roberts Creek) at the powerlines. Back by 4:30pm. Details: Meeting Place: along the B & K Rd (off Hwy 101) at the powerlines @ 1PM. Sad, but true, another logging operation is planned in a beautiful natural forest on the Elphinstone slopes, where residents have been calling for park expansion. Details: Mark your calendars for this Sunday, May 4th @ 1PM. 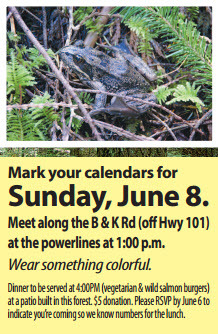 Meet along the B & K Rd (off Hwy 101) at the powerlines. 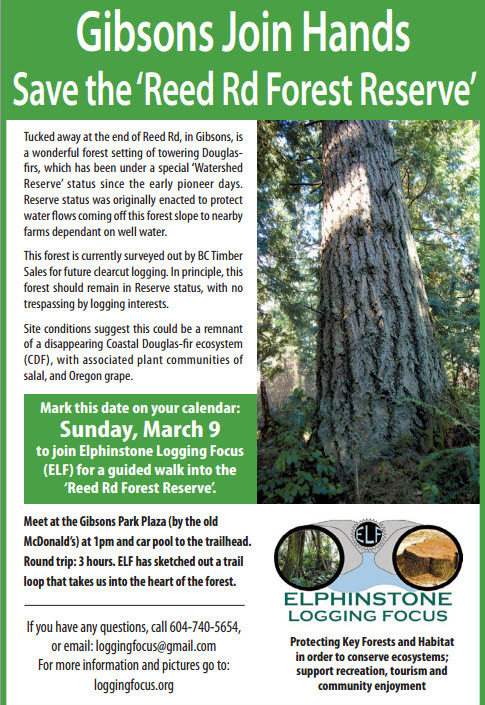 Elphinstone Logging Focus (ELF) will be leading a group across a key section of the Trailfest Wagon Rd Trail (Wagon Trail). Formerly a skid trail, where a team of oxen would pull timber selectively logged back in the Coastal pioneer days; it’s now a popular hiking and biking route of both local and national significance. The ‘Wagon Trail’ passes through a deep-green forest, crosses numerous step-pool streams that support ideal amphibian habitat. 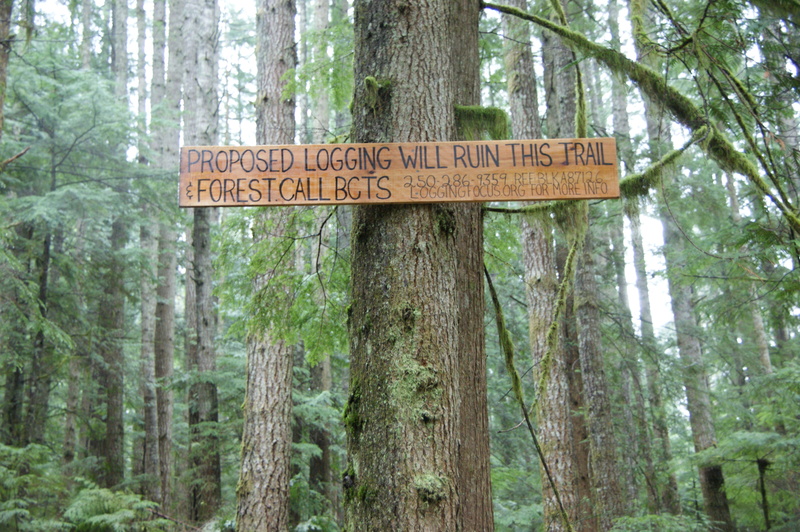 The trail has been impacted by clearcut logging and not properly restored to any semblance of its original state. Our walk will also take us into one of the finest patches of ‘emerging’ old-growth forests left on the Elphinstone slopes. Expect to be awed by the wonders of this lush, jungle-like environment. ELF has been watching over this forest for several years now and had obtained a deferral on its cutting, however plans have arisen again that should alarm the community. Please join us to learn about forest ecology, local history and possible future environmental impacts. Emergency Walk-About in Threatened Forest Reserve. This, Sunday (April 13) ELF is hosting a guided hike through ‘The Reed Rd. Forest Reserve’ which is flagged for logging. Meet in Gibsons, at the IGA parking (south side) at 1PM. Folks this forest has been a watershed reserve from the start of Gibson’s history, but now BC Timber Sales (with support of the Province) wants to remove its protective status and commence logging at some unknown date. To top it off, this is pure Coastal Douglas-fir forest – an endangered forest ecosystem. Mark this on this one calendar as its an important campaign to join hands on, fight for and to win now and for future generations. Round trip 3 hrs. Moderate level hiking. Details: Come out Sunday, January 5th, 2014 – we’re meeting at 10:30Am along the B & K Rd off Hwy 101. At the power lines pull over to the right. Bring lunch, water and/or hot beverages. To view images and get further background details check out the campaigns section on the website here, view our facebook page and the images taken by TJ Watt of the Ancient Forest Alliance. The Health Trail is approx. 4kms (2.5 miles) in length on varied terrain crossing 10 creeks on narrow foot bridges. This trail has a 7.5 rating for difficulty. Hikers must be in good shape. Estimated round trip: 3.5 hrs. No dogs as cougar, bear, deer, elk, bobcat, pheasants, fox (sighted 12/10/13) and grouse are found throughout the Elphinstone area. Kids 10 yrs and older are encouraged to try it out. In Japan, there’s a term; ‘Forest Bathing’ to reflect the positive benefits that the forest green and its oxygen production has on health. These trees are working 24/7 for us. Once you discover this awesome new trail route then make it a part of your regular outdoor recreation. Come out Saturday, October 26th, 2013 meeting at 10:30am along the B & K Rd off Hwy 101. At the power lines pull over to the right. Bring lunch, water and/or hot beverages. Walk Cancelled – Walks will resume in the next 2 to 3 weeks. Please check back here, our facebook page, in the local newspapers for advertised future walks and for email walk updates. If you are not on our list consider signing up through links on our website. Thank you. Ancient yellow cedar trees in excess of 1000 years old. Walk: The Roberts Creek Headwaters Ancient Forest, this Sunday, June 30th. Meet at the Roberts Creek Hall at 1PM. Round Trip: 3-4 hours. Details: Meet at the Roberts Creek Hall at 1 PM. Details: Sunday, June 9th, 2013 @ 1PM meet at the upper Roberts Creek Community Hall parking lot, then car pool to the trailhead along the Wilson Creek Forest Service Road (accessed at the top of Lockyer Rd. in Roberts Creek). Trail is well defined and is rated as medium and requires one to be in good physical condition. Across the lower slopes of Mt. Elphinstone lies a provincially unique forest ecosystem. Where in the B.C. do you find a mountain slope rising gently from the ocean eventually meeting the rugged Coast Mountains? Right here on the lower Sunshine Coast and its something to experience and celebrate. Elphinstone Logging Focus (ELF) invites all outdoor enthusiasts to walk a new trail that goes across an unexplored section of the Elphinstone slopes. The trail is a large loop taking us to towering Douglas-fir Veterans, through fern filled mossy gullies, follows animal trails and comes out into secret grottos. The David Suzuki Foundation is challenging Canadians to commit to spending 30 minutes per day outside in nature for 30 days to help improve over all health. In this spirit, we’ve decided to call the trail ‘The Elphinstone Community Health Trail’. We encourage parents to bring their children along for this inspiring walk through some of the greenest forests on the planet. Let’s get moving and have this forest become part of our weekly health regime. ELF respects that these Elphinstone slopes are on shishalh traditional territory (Sechelt) and that these lands were never sold or given away to the ‘Crown’. In addition, these forests provide bio-diversity for many forms of life. Time: 1 PM meetup at the Roberts Creek Community Hall (upper parking lot) and we`ll coordinate rides. It’s just a 10 minute drive from the Community Hall to the trail-head – trail walk is approximately 2 to 3 hours in total). Details: medium diffuclty walk (should be healthy and fit). Trail undulates – no elevation gain. Please check out Campaigns section for full details – Protect Elphinstone Living Garden Forest – (BCTS) TFL A87126 Cutblock. ‘The Elphinstone Living Garden Forest’, is an intact forest, on the lower Mt Elphinstone slopes showing old-growth characteristics. Step-pool streams create ideal amphibian habitat. There’s evidence of elk, deer and bear. Huge dead-standing trees are slowly creating the next soil layer. It’s a tranquil place that should be left for all-time. Now the bad news: this forest is a BC Timber Sales (BCTS) TFL A87126 Cutblock now surveyed for clear-cut logging. Logging will do irreparable damage to the many other recorded values in place. The area under question is between Clack & Gough Creeks along Roberts-Flume FSR Br. 1. There’s been no public input on this proposed logging, because as we know, we live in a Timber State. Here’s your chance to see what’s up in this forest and what could be coming down. This area is shishalh (Sechelt) traditional territory, and within the proposed 1,500ha Mt. Elphinstone Prov. Park expansion. 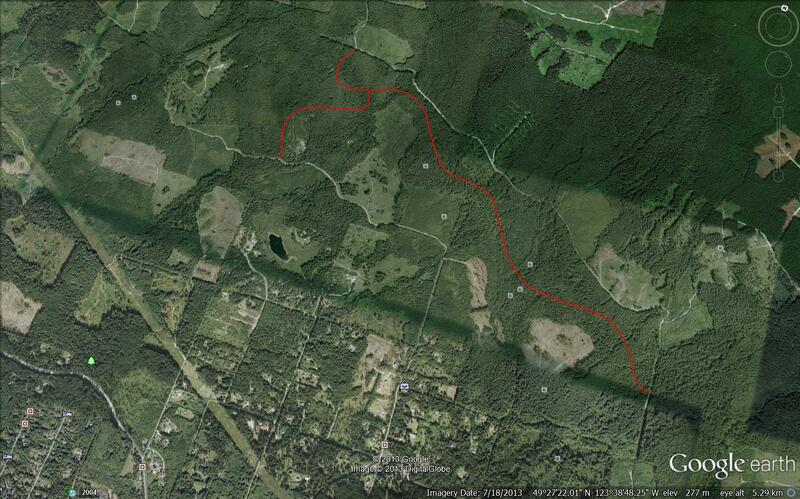 Note: TrailFest Wagon bike trail cuts through the surveyed block and will become part of a massive clear-cut. Mountain bikers will be concerned about the loss of this trail in a worldclass biking area. Time: 1 PM meetup at the Roberts Creek Community Hall (upper parking lot) and we`ll coordinate rides. It’s just a 10 minute drive from the Community Hall to the trail-head – trail walk is approximately 1 1/2 hours in total). Additionally – Visit the Get Involved >Take Action section here on the website and send an email of support to save this forest. It will only take a few minutes. All information and emails are provided. 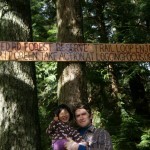 All you have to do is go to the Wilson Creek Forest Campaign and send an email in support of protection of this forest. It is also a key westerly forest lying within the Proposed 1500Ha Mt. Elphinstone Park Expansion area so you can easily send an email for this campaign as well. Thank you. Walk: Wilson Creek Forest Trail Walk (8-26-2012)| Walk includes an acoustic guitar perfomance by Juno nominated Joel Fafard. | Plus Come, see and enjoy the new 27 Bio-diversity loop trail stations. As advertised in this week’s www.localweekly.ca all residents concerned about the threat of logging another close proximity, irreplaceable, old-growth forest on the Sunshine Coast to come out for a guided walk into the threatened Wilson CreekForest, on the lower slopes of Mt. Elphinstone. Details: As advertised in thelocalweekly. Time: 1 PM meetup at the Roberts Creek Community Hall (upper parking lot) and we`ll coordinate rides. It’s just a 20 minute drive from the Community Hall to the trail-head – trail walk is approximately 2 hours in total). Additionally – Visit the Get Involved >Take Action section and send an email of support to save this forest. It will only take a few minutes. All information and emails are provided. All you have to do is go to the Wilson Creek Forest Campaign and send an email in support of protection of this forest. It is also a key westerly forest lying within the Proposed 1500Ha Mt. Elphinstone Park Expansion area so you can easily send an email for this campaign as well. Thank you. Please Print Out, Sign and Bring to the Trail Walk. Thank you. Description: This a community walk into Day Rd Forest. Everyone should meet at 1 PM at the end of Day Rd. The trail walk is approximately 2-3 hours round trip. There will be a ‘Photo-Opp’ for the community to state their opposition to Island Timberlands logging a highly-valued recreational area. Description: TrailFest-Wagon Forest contains a network of mountain biking, walking and historic trails that would be partly or completed destroyed by logging. Calling on all mountain bikers who love this area to bring your bikes for a photo-op. Additionally – Visit the Get Involved >Take Action section and go to the Park Expansion Campaign and TrailFest-Wagon Forest Campaign and send an email in support of protection and the 1500Ha Mt. Elphinstone Park Expansion Proposal. Time: 1 PM meetup at the Roberts Creek Community Hall (upper parking lot) and we`ll coordinate rides. It’s just a 20 minute drive from the Community Hall to the trail-head – trail walk is approximately 1 1/2 hours in total).